As a family grows, so does their home. 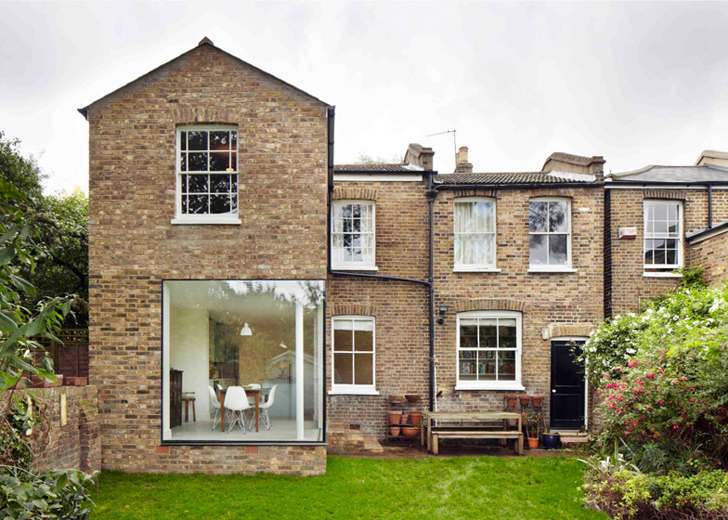 Architects Cousins&Cousins expanded a Victorian house in East London (called the Vegetarian Cottage) into a modern home for a family that decided to adapt their space to suit their growing needs. Original brickwork leftover from the demolition process was used in the new build, which combines large glass surfaces and natural materials to create the perfect hybrid of old and new. Called the Vegetarian Cottage, the house is thought to stand on the site of the London branch of the Vegetarian Society founded in the mid 19th century. The house is inhabited by a family of six who had outgrown their four bedroom home and decided to alter their existing property. They commissioned Cousins&Cousins to add a second floor and reorganize the ground floor by combining the kitchen and dining areas into a single open-plan space. The new dining room area boasts a new modern window facing the garden, while reclaimed brickwork from the former living room wall was used to blend together the old and the new structures. Part of it was removed from the corner of the dining room extension in order to fit the new corner window, framed with slim black metal surrounds. The result? The perfect hybrid of old and new. Called the Vegetarian Cottage, the house is thought to stand on the site of the London branch of the Vegetarian Society founded in the mid 19th century. The house is inhabited by a family of six who had outgrown their four bedroom home and decided to alter their existing property. They commissioned Cousins&Cousins to add a second floor and reorganize the ground floor by combining the kitchen and dining areas into a single open-plan space. The new glazing permits a lot of daylight to penetrate the interior. 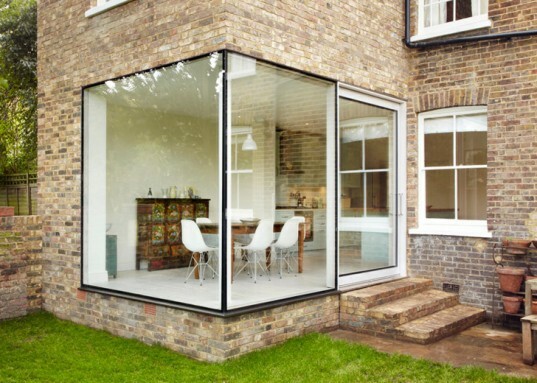 The new dining room area boasts a new modern window facing the garden, while reclaimed brickwork from the former living room wall was used to blend together the old and the new structures. Part of it was removed from the corner of the dining room extension in order to fit the new corner window, framed with slim black metal surrounds.